In many ways, 1989 feels like a year of regression. Several teams go back to "classic" line-ups, including the Fantastic Four, Avengers, and Alpha Flight. 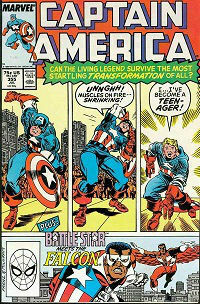 Steve Rogers goes back to being Captain America. Thor, already a direct homage to the 1960s at this point, is bonded with a human identity again. 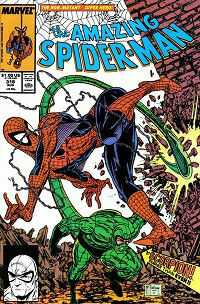 The secondary Spider-Man books, written by Gerry Conway and drawn by Sal Buscema and Alex Saviuk, deliver a very traditional approach to the character. On the other hand, Rob Liefeld debuts this year, joining Todd McFarlane, Jim Lee, Whilce Portacio, and Erik Larsen as a group of pre-Image artists that are redefining Marvel's art style. That and the increased use of characters like Punisher and Venom represent the other side of the Tom DeFalco era, a strange dichotomy between retro and the new trend. The situation with the X-books is more unique. Inferno wraps up a number of longstanding subplots. Among other things, this results in clearing the way for a Cyclops/Jean Grey romance without having to deal with the existence of Madelyne Pryor. It also makes the other teams aware that the X-Men are actually alive. It restores Angel to X-Factor. It concludes the story of Magik and writes her out of the New Mutants cast. 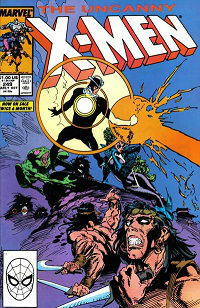 And directly afterwards, it moves the New Mutants away from Magneto, making them charges of X-Factor. But then, following Inferno, all of the X-teams except for the X-Men wind up getting sent on long trips off Earth, as if being put in a holding pattern while the X-Men team dissolves. This year is marked by creative team strife. Walt Simonson leaves X-Factor due to editorial interference and his Avengers run is aborted right after he introduces a controversial line-up (and longtime artist John Buscema leaves as well). After being fired from West Coast Avengers last year, Steve Englehart is fired from Fantastic Four (replaced by Walt Simonson) and then Silver Surfer. John Byrne returns to Marvel to take over Avengers (as writer) and West Coast Avengers (as writer/artist), and also begins a new She-Hulk series. But he's quickly removed from She-Hulk after a dispute with his editor over Dwayne McDuffie's prestige format She-Hulk series. David Michelinie & Bob Layton's second Iron Man run comes to an end. Roy Thomas replaces Peter Gillis on Doctor Strange. Bill Mantlo ends his long association with Marvel, leaving Alpha Flight and Cloak & Dagger (replaced by James Hudnall and Terry Austin respectively). The secondary Avengers books are renamed, formalizing the idea that it's a franchise and making sure the books are grouped together in stores. West Coast Avengers becomes Avengers West Coast, and Solo Avengers becomes Avengers Spotlight. As with 1988, there are three major crossovers that at least partially occur this year: the end of Inferno, Atlantis Attacks, and the beginning of Acts of Vengeance. This is in addition to bi-weekly summer events for several books: Bloodstone Hunt for Captain America, Assassin Nation for Spider-Man, and Gehenna Stone for Wolverine (and "Dissolution and Rebirth" for X-Men, although it's only called that in advertisements). The Dolph Lundgren Punisher movie was supposed to come out this year (it winds up only getting released only in Germany until 1991), resulting in Marvel publishing additional graphic novels for the character (who was already starring in two books), plus a new all-reprint Magazine and a focus on Punisher reprints in Marvel Tales. The explosion of new books continues. This year adds Quasar, She-Hulk, Moon Knight, and Nick Fury. This is in addition to the five new books that were added last year (plus the fact that Strange Tales became Cloak & Dagger and Doctor Strange). The only cancellation is Speedball, although it's hard to understand, based on quality or sales, how Alpha Flight and Power Pack kept going. In addition to this, some books go bi-weekly during the summer. Marvel also does a recalibration of its cover date practice, so that the cover dates are only a month in advance of publication date, instead of two. This results in multiple issues having the same cover date (e.g. Nov and then Mid-Nov) as things get caught up. The end result is a much larger list of books on this year's category page. Last year's strategy of increasing the books of popular titles to $1.00 only delays the increase of the rest of the line from 75 cents to $1.00 until the September cover date books. Annuals are $2. Prestige format direct-market books (including Doctor Strange, Moon Knight, Punisher War Journal, and Cloak & Dagger) are $1.50. Jean Grey's memories merged with Phoenix and Madelyne Pryor's. Psylocke becomes an Asian ninja.